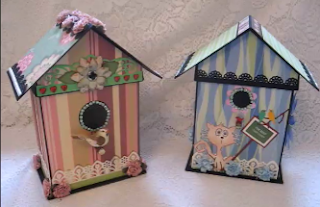 In this tutorial, I show you how to create my Birdhouse & Scrapbook Mini Album Set. thickness of 5-1/2” at the top of the roof. The scrapbook album measures 7”w x 5-1/2”h and is 3-1/2” thick. The left side of the album has two cover flaps that fold over a stack of photo mat pages. The right side of the album has pages made with paper bags. I show you how to make your own “paper bags” from cardstock or scrapbook paper in case you don’t have the same size bags. I used mostly paper I had left over in my stash to make these sets. I did use a few sheets of the Tim Holtz Idea-ology bird-themed papers for the set on the left. For the cat album set that I refer to as a demo in this tutorial, I used a few sheets of cat-themed paper by “Forever in Time”. The tutorial is in PDF format and contains 50 pages of extremely detailed step-by-step instructions with about 225 photos that show how I created this project from start to finish. Measurements are included for each piece you will need to construct the set. A list of supplies I used to make this project is available at www.scrappinrabbit.com/p/supply-list-birdhouse-scrapbook-mini.html. Below are a few more photos of the set I make in this tutorial. By purchasing this tutorial, you can make as many Birdhouse & Scrapbook Mini Album Sets as you wish for personal use. You can also make and sell the sets you make. If selling completed sets online, please credit me by including a link to my website: “Tutorial for making this birdhouse and scrapbook mini album set is available from www.scrappinrabbit.com”. If you would like to teach classes on how to make this birdhouse and scrapbook mini album set, a “Classroom Licence” is available for $29.99. You can teach as many classes as you wish. Note: Students each need to purchase a tutorial. Student tutorials can be purchased at a special price if ordered and paid for by the purchaser of the Classroom Licence. Contact me at scrappinrabbit@gmail.com if interested.